I’ll be honest. When Brian Halligan (HubSpot’s CEO) started talking about retiring the funnel and adopting the flywheel as the model to think about our business, I was not very happy. See, I love the funnel. It’s been my trusted sidekick for years. It’s given me the hard feedback I’ve needed, celebrated my team’s successes, and gotten me out of more growth troubles than I care to admit. I love the funnel so much that my team at HubSpot was literally called the Funnel team, and the opening slide of my global team kickoff this year was a photo of about 25 funnels. So no disrespect to Brian, but “retire the funnel”? Yeah right. That is, until I started learning about flywheels. Turns out, they’re pretty amazing. Funnels lose the energy you put into them once you reach the bottom, but flywheels are remarkable at storing and releasing energy. Invented by James Watt (yes, the guy whose name is on every lightbulb) over 200 years ago, a flywheel is simple a wheel or disc on an axis, that’s incredibly energy-efficient. The amount of energy it stores depends on how fast you spin it, how much friction there is, and the composition of the wheel itself -- how big it is and how much it weighs. Flywheels are used in cars, trains and power plants. Here’s why this model changed my mind. Despite the funnel being my first love, I have to admit that its linear approach to measuring growth is a huge weakness. Funnels produce customers, but don’t consider how those customers can help you grow. And all the momentum you built acquiring that customer? Gone. Each day, each month, and each quarter, we have to start new. This isn’t just inefficient, it’s a major problem. Ignoring how customers can help you grow is perilous in today’s world. Word of mouth has always been fundamental to great marketing, but look at the world we living in today. Trust is at an all time low, it’s harder to get distribution on Google and Facebook, and prospects are doing far more independent research than they ever have. With word of mouth being so crucial, losing the momentum you generate in creating a new customer is a real drag on your growth. Whereas funnels lose their momentum at the bottom, flywheels leverage their momentum to keep spinning. Also, because they preserve momentum so well, all of the additional energy you add to spin it faster adds to the capacity of the whole. I know what you’re thinking: Are we just debating jargon for the sake of it? No -- when you think of your business as a flywheel instead of a funnel, you make different decisions. Flywheels represent a circular process where customers feed growth. We’ve invested more in customer marketing, more in customer advocacy, and more in creating delightful onboarding for new customers. We’ve also invested in an integrations ecosystem that helps customers do more with HubSpot and creates real value for people who adopt our suite of software. Friction kills flywheels. 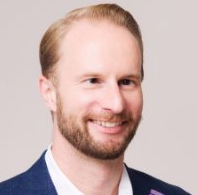 We’ve made investments that systematically target our biggest points of friction: Great free software as an entry point, channels that help people connect now instead of later, a sales process that solves for prospects, and a broad range of customer education. The best teams will have strategies for all three. Let’s start with how fast you spin it. The speed of your flywheel is increased by applying more force in the areas where it can have the biggest impact. In a funnel model, all force is applied to attract and acquire customers. In a flywheel model, you also apply force to delight those customers and make them successful. Since you’re applying all sorts of force all around your flywheel, ensure that none of your investments oppose each other. A lack of alignment between sales and customer success, for instance, can create unhappy customers and slow your flywheel when they churn. Classic sales and marketing misalignment is another area where the flywheel can slow. Alignment is crucial. You can reduce friction by finding the inefficiencies where your customers are losing momentum, and making them better. Improving conversion rates, delighting customers at scale, and addressing issues that cause you to churn customers increase the speed of your flywheel. 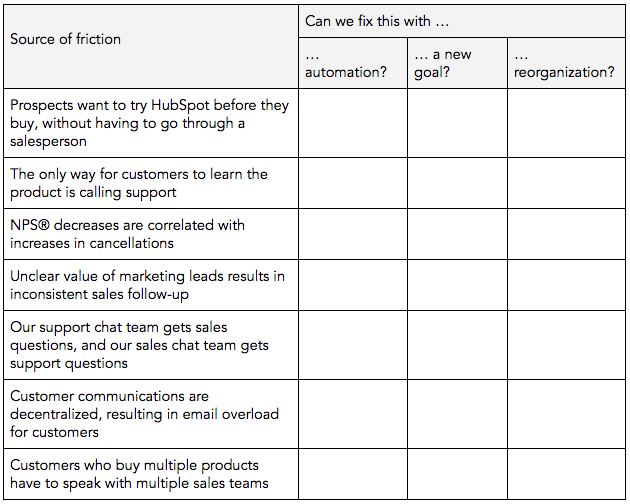 The other crucial area to consider when thinking about friction is how your teams are organized. 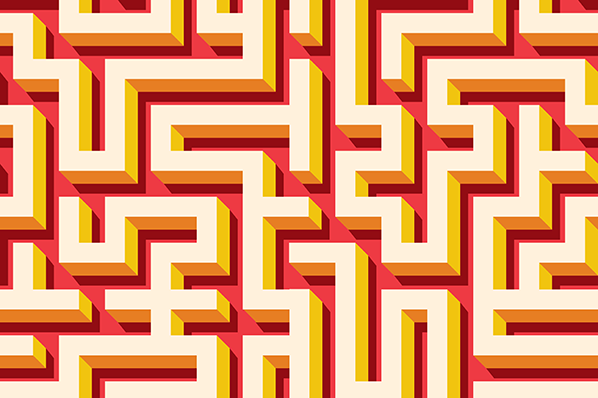 Silos, handoffs, and specialization all create friction. As you successfully increase speed and decrease friction, you will create more delighted customers. More delighted customers means a “heavier” wheel, and one that produces more energy when spun. Said another way, your flywheel produces more growth as your customer count increases. If you can add “density” to those customers, by getting them to adopt more of your products or be more “sticky,” even more momentum and growth can be achieved. 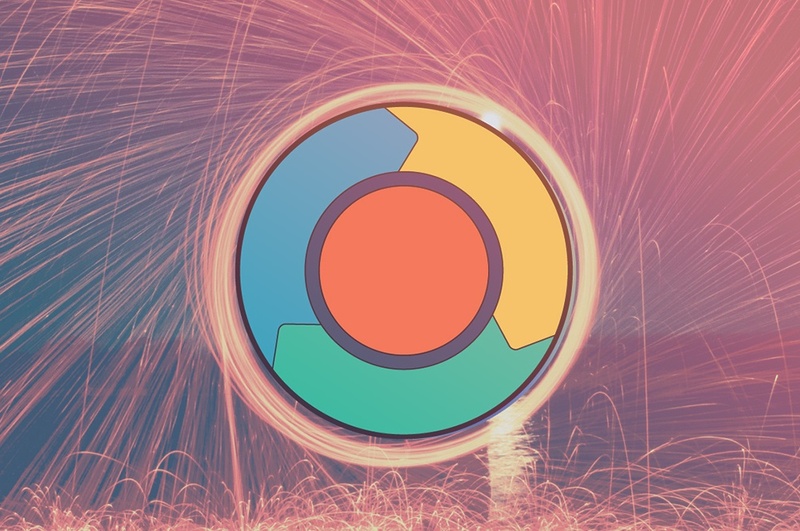 To help you build your flywheel and turn it into a growth tool for your business, I’ve completed his homework for HubSpot’s flywheel, and provided a guide for you to do the same. Our first task is understanding the status quo of your flywheel. 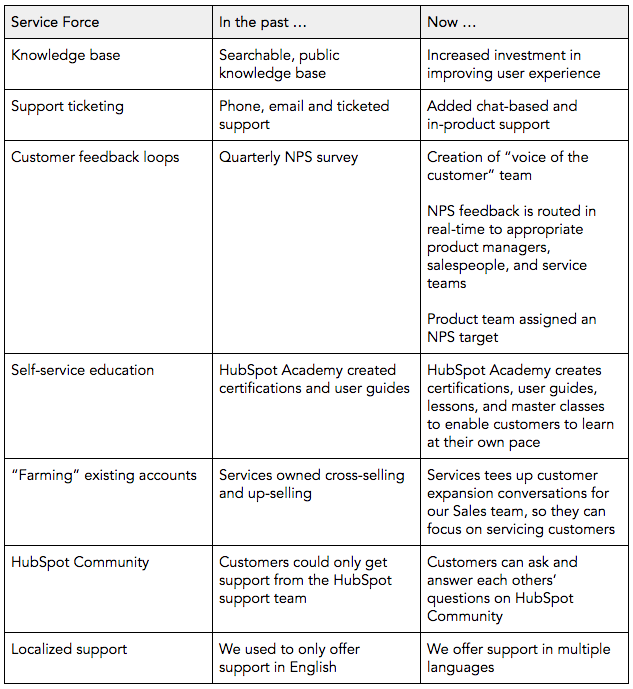 At each stage depicted below -- attract, engage, and delight -- HubSpot has different priorities and commitments that we’ve made to our prospects and customers. Attract: Attracting is about using your expertise to create content and conversations that start meaningful relationships with the right people. Engage: Engaging is about building lasting relationships with people by providing insights and solutions that align with their roadblocks and goals. Delight: Delighting is about providing an outstanding experience that adds real value, empowers people to reach their goals, and become promoters of your company. What investments are we making at each stage of the flywheel? How are we measuring the success or failure of those investments? In this step, identify the core activity or program your company has invested in to uphold each of your Attract, Engage, and Delight commitments. Fill out each activity corresponding to its flywheel stage. You may find that one flywheel isn’t enough to encompass all your company does. That’s perfectly okay -- there are probably multiple flywheels spinning in parallel. The purpose of this exercise is to distill the core parts of your business, so focus on the most important activity at each stage. 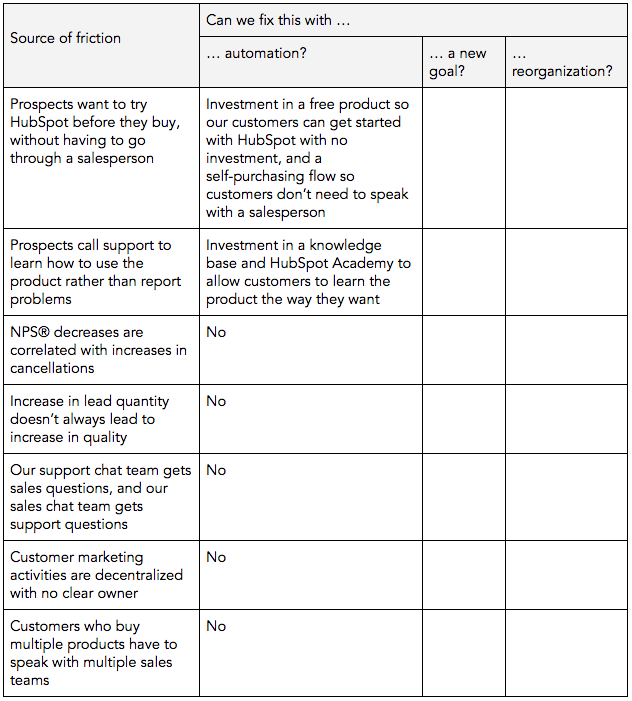 Attract: At HubSpot, we use inbound marketing principles to get our flywheel spinning. To provide value before we extract value, we’ve heavily invested in free content through our blogs, webinars, campaigns, social media, and HubSpot Academy lessons and certifications. Engage: To make it easy for prospects to engage with our product and potentially purchase them, we offer free versions of our software so users can try before they buy and seamlessly upgrade. Delight: We help our customers succeed through a mix of guided and self-service education. Paying customers have access to a core implementation and strategy team, free users are offered light-touch free support, and both groups are given access to extensive user guides and knowledge base documentation. In this step, identify the most important metric for each activity. Make a note of conversion rates between each stage here as well -- this measures the friction in your flywheel. Then, record (either month-over-month or year-over-year) how much you added or lost in that bucket, and your total number. Attract: Our topline metric here is monthly website traffic. We measure how much traffic we gain month-over-month. Engage: HubSpot’s flywheel moves visitors through the “Engage” stage in two steps. First, we’re focused on how many free users of our product enter our flywheel each month. We also measure how many of those users churn. The more free users that we have the better the composition of our flywheel is and the more momentum it can generate. Second, we build upgrade points in our product where free users can become qualified leads. We track how many of those qualified leads close into paying customers, and then track how many of these churn. Each churn causes us to lose momentum. Delight: We run Net Promoter Score® surveys with our customer base quarterly, and we track the number of customers who are promoters -- that is, how many customers say they would recommend HubSpot to a friend, and how many drop from promoters to passives or detractors. When you’re just starting to grow a business, most of your resources will be focused on the attract and engage parts of your flywheel. Rightly so -- it takes a lot of investment to build enough momentum to get your flywheel spinning. 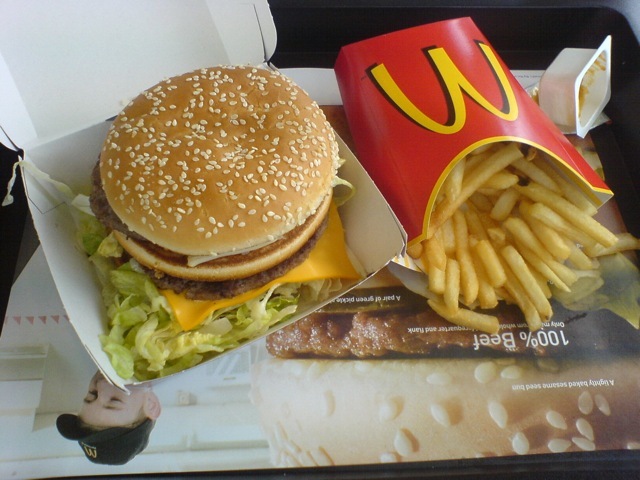 But once it is, consider whether your resources could be better spent focusing on delighting customers. That’s because once your flywheel is spinning, momentum comes from retaining customers and transforming them into promoters who will advocate for your brand and even bring you new business. In this assignment, examine the “forces” -- activities and programs -- that currently move your customers through your flywheel, and consider whether they are designed to serve your process or your customers’ needs. Then, list out what changes you’d need to make to those forces in 2019 to help maximize delight. At HubSpot, we underwent this exercise at the beginning of 2018. 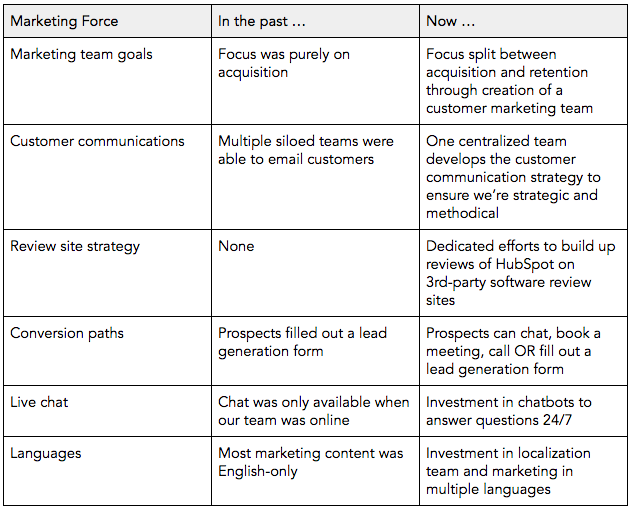 Here’s how our forces have evolved across our marketing, sales, and services teams. This is by no means an exhaustive list of the changes we’ve made to re-center our focus around the customer, but they’re examples of some of the biggest shifts we’ve made in our go-to-market and services organizations. There are many ways to reduce the friction in your flywheel. One way is to smooth out common friction points, like your conversion rates between different phases, how many customers become successful, and how many churn. It’s not too difficult to identify this type of weakness, because you’re dealing with metrics that are largely isolated from one another. It’s harder to see the forest for the trees, and examine how the overall structure of your company might be contributing to drag and friction. So for this assignment, we’re going to focus on one of the thornier sources of friction at your company: Your organizational chart. 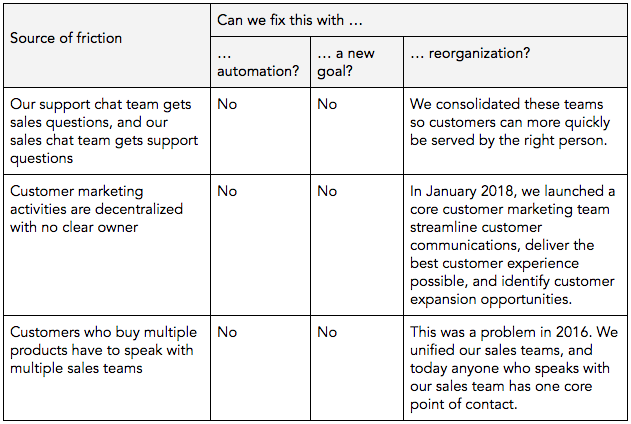 Siloed work and poor handoff between teams are some of the biggest areas of friction in most flywheels, and at HubSpot are a legacy from our funnel days. Where are your points of friction? What can be addressed through shared goals? What can be addressed through team reorganization? We’ll go step by step here. Where is there drag in your organization? Externally, think about the complaints you hear from customers and prospects -- where do they have difficulty interacting with your company? Internally, consider which metrics you struggle to move despite repeated efforts, processes that take longer than they should, and sources of common problems. Consider the activities your customers and prospects want to do, but are complex for humans to execute. In addition, look for the repetitive, mechanical tasks that fall on your team’s plates -- can you free up their time for work that’s more valuable for your customers? Also consider which parts of your go-to-market currently rely purely on your employees to function but could be supplemented by automation. 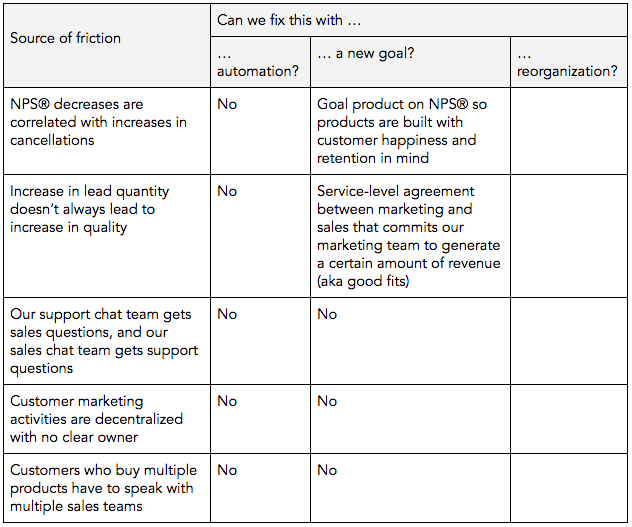 Often, friction exists because two teams are moving in opposite directions. For example, marketing is traditionally goaled on an overall lead generation number -- but optimizing for lead quantity doesn’t always lead to good-fit customers. Within every organization, there are problems that can’t be fixed by automation or goal realignment. In those cases, a reorganization may be necessary. Do employees who work in the same functions sit across different departments? If your organization has a systemic blind spot, do you have a team dedicated to solving it? So that’s our flywheel. I may have been hesitant at first, but after I used this framework to assess the areas we could improve … well, I’m a believer. As you step through this exercise, screenshot your flywheel and share them on Twitter or Instagram using the hashtag #OurFlywheel. Brian will be monitoring this hashtag until September 14 at 12 p.m. EST. If your company shares his favorite flywheel, he’ll send you two VIP passes to INBOUND 2019. Terms and conditions apply and are included below. ELIGIBILITY: Open only to persons who are 18 years of age or older and U.S. or Australian residents. Employees of HubSpot, Inc. are not eligible to enter or win a prize. All applicable federal, state and local laws and regulations apply. Void where prohibited or restricted by law. NO PURCHASE NECESSARY. A PURCHASE WILL NOT IMPROVE YOUR CHANCES OF WINNING. OurFlywheel Homework GIVEAWAY PERIOD: The OurFlywheel Homework Giveaway entry period begins at 2:00pm EDT on Sept 5, 2018 and ends at 12:00pm EDT on Sept 14, 2018 (the "OurFlywheel Homework Giveaway Period"). Winners will be selected from entries properly submitted and timely received during the OurFlywheel Homework Giveaway Period. HOW TO ENTER: During the OurFlywheel Homework Giveaway Period, enter by using #OurFlywheel on Twitter and/or Instagram, with picture of flywheel. Include description as desired in body of message. Multiple messages permitted for descriptions (an “Initial Entry”). Limit one (1) entry per person, per company, and per household during the OurFlywheel Homework Giveaway Period via online entry, regardless of whether a person has more than one address or more than one person uses the same address. ALTERNATIVE MEANS OF ENTRY: In lieu of an online entry, you may enter the OurFlywheel Homework Giveaway by mailing a standard-size postcard with a drawing and description of your company’s flywheel to: HubSpot OurFlywheel Homework Giveaway Entries, c/o HubSpot, Inc., 25 First Street, Cambridge, MA 02141. Postcard entries must be postmarked during the OurFlywheel Homework Giveaway Period to be included in the winner selection process, and no more than one Flywheel homework may be submitted during the OurFlywheel Homework Giveaway Period. WINNER SELECTION: One winner will be determined by a panel of experts employed by HubSpot, based on originality and completeness on Sept 30, 2018. Winner will be selected from entries received during the OurFlywheel Homework Giveaway Period. The potential winner will be notified via email to the email address submitted with the potential winner’s entry within two (2) weeks after the selection]. The selection will be conducted by HubSpot, the judge of the OurFlywheel Homework Giveaway, whose decisions on all matters relating to the OurFlywheel Homework Giveaway shall be final. In the event that a potential winner is disqualified for any reason, HubSpot may, in its sole discretion, award the applicable prize to an alternate winner selected by the panel of judges. PRIZES/ODDS OF WINNING PRIZE: The winner will receive two (2) VIP passes to INBOUND19. Approximate Retail Value (ARV) of each prize: $4,400 USD. Overall odds of winning depend on number of entries received during the OurFlywheel Homework Giveaway Period. No prize substitution or cash equivalent of prize. No prize transfer. CONDITIONS: HubSpot reserves the right, at its sole discretion, to cancel, terminate, modify or suspend the OurFlywheel Homework Giveaway (or portion thereof). HubSpot also reserves the right at its sole discretion to disqualify the entry of any individual. All federal, state and local taxes on prize and any expenses not specified herein are the sole responsibility of winner. Should a dispute arise regarding the identity of the claimant, HubSpot reserves the sole right to determine the eligible party. BY ENTERING, ENTRANT WAIVES ALL RIGHTS TO BRING (AND COVENANTS NOT TO BRING) ANY CLAIM AGAINST HUBSPOT OR ANY OTHERS ASSOCIATED WITH THIS OurFlywheel Homework Giveaway. ENTRANTS FURTHER AGREE TO RELEASE AND HOLD HARMLESS HUBSPOT FROM ANY AND ALL LIABILITY ARISING FROM THEIR PARTICIPATION IN THE OURFLYWHEEL HOMEWORK GIVEAWAY, OR HUBSPOT’S USE OF ANY ENTRY INFORMATION. Any disputes that may arise hereunder shall be governed in all respects by the laws of the Commonwealth of Massachusetts without regard to the conflicts of laws principles of any jurisdiction. Venue with respect to any such disputes shall be had in the state and federal courts of the Commonwealth of Massachusetts. THIRD PARTY WEBSITES: This OurFlywheel Homework Giveaway is in no way sponsored, endorsed or administered by, or associated with, Twitter or Instagram, or any of their affiliates. YOU RELEASE TWITTER and INSTAGRAM OF ALL LIABILITY RELATED TO THIS OURFLYWHEEL HOMEWORK GIVEAWAY TO THE FULL EXTENT PERMITTED BY LAW. Any entrant who creates multiple accounts with Twitter or INSTAGRAM for the purposes of increasing the odds of winning this OurFlywheel Homework Giveaway will be disqualified. All entries via Twitter must comply with Twitter Rules and Instagram Rules. If you have any questions or comments about the OurFlywheel Homework Giveaway, please direct them directly to us, the Sponsor. PUBLICITY AND RELEASE: As a condition of entry into the Giveaway, except where prohibited by law, each entrant and each winner by accepting a prize grants to HubSpot all right, title and interest in, to publicize, broadcast, display and/or otherwise use, the Giveaway entrant’s name, city, state, and biographical material (collectively, “Licensed Rights”) in any media for advertising and publicity purposes, without additional review, compensation, or approval of the winner. As a further condition of entry into the Giveaway, each entrant, and each winner by accepting a prize, grants to HubSpot a worldwide, royalty-free, non-exclusive, perpetual license to display, reproduce, distribute, prepare derivative works of, and otherwise use any of the answer text submitted with an entrant’s entry, in any media and for any purpose, without additional review, compensation, or approval by the entrant. Entries must not infringe upon the legal rights, including copyrights, trademarks, contract rights, or any other intellectual property rights of any other person or entity. If Winner does not respond to notification, or is not present when prize delivery is attempted, such prize will be forfeited. By participating, entrants agree to be bound by the Official Rules and the decisions of the judges, which are final and binding in all respects. OFFICIAL RULES/WINNERS LIST: For notification of the winners, send a self-addressed stamped envelope to: HubSpot OurFlywheel Homework Giveaway Entries, c/o HubSpot, Inc., 25 First Street, Cambridge, MA 02141. Requests for winners' lists must be received within one month after the end of the Giveaway Period. SPONSOR: HubSpot, Inc., 25 First Street, Cambridge, MA 02141.